who burnt incense when my poodle died. feasting upon the crooked phantoms. into loam quilting bamboo shoots. I denied it, tears rolling down on my crinkling cheek. She suffocated on cologne slipping out of my cuffs. the divine scent of my cologne or carnal arrows of Cupid? coins striking against the asphalt. which could not outgrow her desire beyond the Milky Way. & bathed in the lustre of stars. 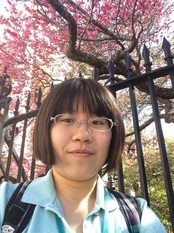 Lavinia Xu is a poet and undergraduate student in Ohio State University. She is a junior and is pursuing a duel degree in Logistics and English. Two of her poems, "Language of the Far End" and "A Summer Day Goes by the River," have been published in Mosaic, the art and literature magazine for undergraduate students at OSU. She currently lives in Columbus, Ohio.